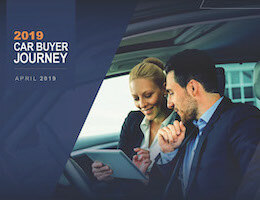 2019 Car Buyer Journey Study Released - Cox Automotive Inc.
More than one-third of car buyers now visit just one dealership before purchase. Nearly half of all buyers take less than 30 days to shop for and purchase a vehicle. Used-vehicle consideration and online shopping are increasing as prices rise. According to a new study released by Cox Automotive, budget-minded, time-strapped, tech-savvy U.S. car buyers are spending a higher percentage of their shopping time online and less total time in market as they hunt for their perfect ride. The 2019 Cox Automotive Car Buyer Journey study also indicates consumers continue to be frustrated by new-vehicle prices and are more likely than ever to be shopping for used vehicles. Cox Automotive’s Car Buyer Journey is a reoccurring study to monitor key changes in consumer vehicle buying behaviors. In late 2018, over 3,000 recent vehicle buyers participated (1,047 used-vehicle buyers and 2,039 new-vehicle buyers). Results are weighted to accurately reflect the market. To see more study findings, read the press release here. Download an infographic of findings from all buyers here, new-vehicle buyers here or used-vehicle buyers here. And, for full details of the 2019 Car Buyer Journey study, download the report below. Cox Automotive’s Car Buyer Journey is a reoccurring study to monitor key changes in consumer vehicle buying behaviors.